The University Libraries launched a new digital exhibit in celebration of Public Domain Day Jan. 1. “A Belated Gift: U.S. Copyright and the Public Domain,” which features Arkansan contributions from 1923 that are now in the public domain, is available to researchers worldwide, free of charge. For 20 years, many copyright guidelines for students and researchers had a boilerplate statement that never needed to be updated: Materials published in the United States before Jan. 1, 1923 are in the public domain. On Jan. 1, 2019, that benchmark shifted forward, with materials published in 1923 entering the public domain. It is important to note that several things could have pulled works published in 1923 into the public domain before that day—publication without a valid copyright notice, failure to renew, or the creator having explicitly designated it to be so. Public domain works are free to be reproduced, reused and revitalized without infringing upon any copyright. Though a non-physical realm, the public domain offers very tangible benefits in terms of cultural exchange, creative activity and intellectual rediscovery. 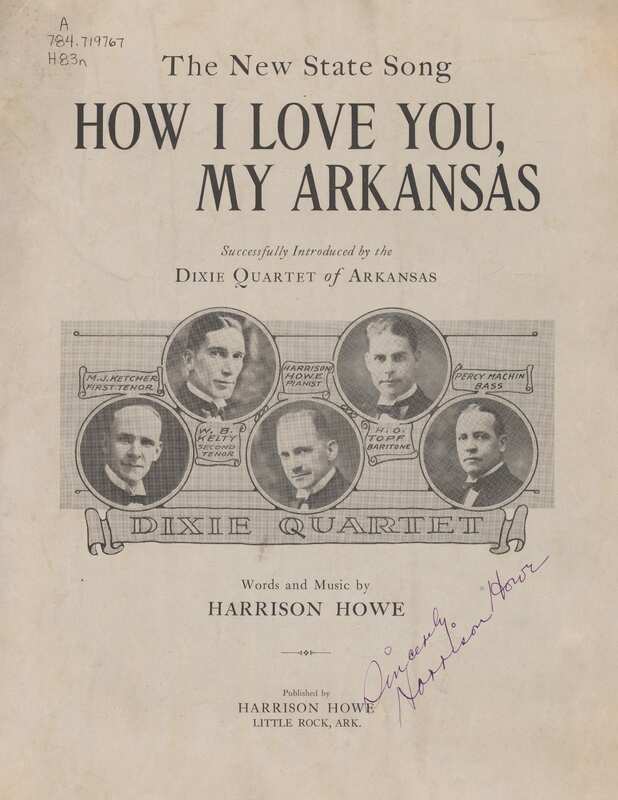 This exhibit is designed to highlight both the creative contributions Arkansans made in 1923—contributions now fully within the public domain—and the continued policy development of copyright in the United States, as viewed through the political papers and constituent correspondence of Arkansas’ congressmen and through the correspondence of authors impacted by this decision making. Katrina Windon, collections management and processing unit head for the Special Collections department, was the subject selector for this exhibit. The project team included Lori Birell, head of Special Collections; Deborah E. Kulczak, head of Technical Services and Database Maintenance; Chelsea Hoover, music and media cataloging assistant; and Martha Anderson, head of the Digital Services Unit. Materials were digitized by Digital Services Unit personnel Lee Holt, Samuel Collins, Dexter Fairweather, Laine McGinty, Wendy McLean, Cassidy McManus, Hannah Mills, Alejandra Rubio, Hanna Williams and Shelby Osbourn. Dylan Hurd and Beth Juhl from Web Services contributed to the webpage design.